I received my Moto X over a month ago so I thought it was high time to tell you what I think of the hardware and to review Republic Wireless’s new service options. I signed up with Republic Wireless almost two years ago and got my first phone with them over a year ago, so I am very familiar with the service. Until last month, I used the Motorola Defy XT, but in January I upgraded to the Moto X. If you’re not familiar with Republic Wireless’s low-cost (as low as $5 per month!) service plans, skip ahead to that section and circle back to read about the Moto X. In short, the new phone is wonderful. Because the Defy XT was my first smartphone, I hardly knew what I was missing working with that older technology! But I now understand why many people were reluctant to sign up for RW if they had previously had an iPhone or similarly capable smartphone. 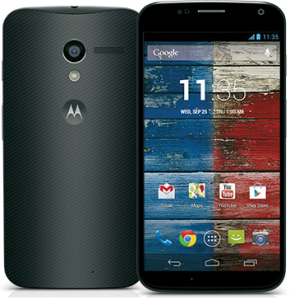 By adding the Moto X to its options, Republic Wireless pushed its hardware into the present day. I’m not a gadgets person so I’m not going to be able to tell you all the specs of this device – you’ll have to look them up elsewhere if you are interested. But I can tell you that I love using the phone. Even Kyle has been eyeing my Moto X with envy, though he has an iPhone 5. There is plenty of storage space, the battery life is sufficient, the screen is large (but not comically so), the camera works well (the Moto X took all the photos in this post except the one of our car), and the phone responds swiftly. It even comes with a built-in typing program similar to Swype, which we dearly missed when Kyle switched from an Android to the iPhone. I’m spending a lot more time on my phone now and even keep it on my person for much of the day (this is a first for me!) because I enjoy it so much – maybe that’s not a good thing! One of the drawbacks of using RW is that you can’t bring any phone onto the service like you can with Ting, for example (read my friend Mrs. Pop’s review of Ting, another low-cost alternative carrier). That has kept many iPhone devotees and those who need the latest and greatest away. But the Moto X can go toe-to-toe with any smartphone currently on the market. If you were holding back on signing up for RW because of the out-of-date Defy XT, please reconsider jumping on the bandwagon with the Moto X! And if you are ready to upgrade your hardware, you should check out Republic Wireless’s services. Even with having to buy the phone up front (the Moto X is $299), using Republic Wireless is much less expensive than having even a stripped-down plan from a major carrier. 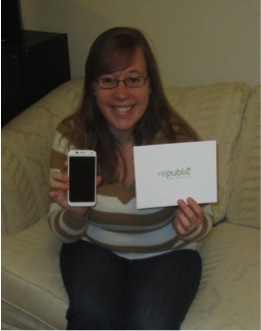 We were very excited when we first heard about Republic Wireless and its business model. Of course, we wanted to get away from our high-cost typical plans with the major carriers. But more compelling was our belief that Republic Wireless’s way of providing cell service is what all the companies should have been doing all along. Republic Wireless works by utilizing wireless networks whenever possible and going over the Sprint cell network when not. To use the service, you have to register at least one wireless network (home or work are the most likely). The great benefit is that there is effectively no limit on the amount of voice, text, and data you can use (the limit is 5 G/month). Because so many of the users are under wireless networks nearly all day long (like me! ), it’s very inexpensive for Republic Wireless to use the Sprint network for the remaining voice/text/data needed and they pass on that savings to their customers. Some people think that you should only sign up for Republic Wireless if you are under a wireless network for most of the day, but that’s not true. It all depends on the quality of the Sprint service in your area (it’s very good in mine). I do like that I’m under my work or home wireless networks almost all day because the data speed is quite fast, but the service would still work if you were out most of the day. I frequently call, text, and use data when I’m out and about and it works great. Of course, your experience will be different if the Sprint network is not robust in your area, but it may still be valuable for you to consider the $5 or $10 per month plans (below). I’ll also tell you some of the minor issues I’ve had with Republic Wireless. The Sprint network, while good in my area, does not provide as complete coverage as Verizon does (however I think it has better coverage than my previous carrier, AT&T). The one time I tried to send an MMS message it failed (not sure why), though Republic Wireless says that the Moto X can do it. (Update 3/9/2014: Since this review, I have been able to receive MMS messages.) With the Defy XT, I experienced dropped calls when moving out of a wireless network. I have heard that the switchover from wireless to cell is much improved with the Moto X, but I haven’t tested it out for myself yet (aren’t we all making a lot fewer phone calls these days?). (Update 3/9/2014: I have now twice moved from wireless to cell coverage while on a call and both transitioned without a hitch!) For me, these slight problems have virtually no impact on my life, but you should consider them alongside the benefits of the service. One more note: Republic Wireless has a 30-day guaranteed return policy. So if you order your phone and decide that it’s not going to work for you for whatever reason, you can return it, not be out any money except for shipping, and at least be satisfied that you gave it a shot! Please also read my past posts on Republic Wireless – when I first signed up for the beta wave, a review of the service several months into using it, and when Republic Wireless announced the release of the Moto X. If you are interested in signing up with Republic Wireless, I would be honored if you would use the banner below to do so. Thank you for supporting EPF! My enthusiasm for this service has not been influenced by the possibility of commissions – in fact, my first (very positive) review of Republic Wireless was published before the referral and advertising programs even existed. I’m just excited to show others how they can escape the high-cost quicksand that the major cell companies have them in and receive an excellent service and product for a reasonable price. And who doesn’t want more value for their dollar? Would Republic Wireless or another MNVO work for you? Are you satisfied with the service you’re getting for the price you’re paying? Do you chase the latest and greatest smartphone technology? 31 Responses to "Moto X from Republic Wireless Review"
I’ve still got the Defy and it’s really been annoying me lately. I don’t know if it’s actually getting slower with everything or if I’m just noticing it more, but either way I find myself getting frustrated. My hesitance with just getting the Moto X is that I also have issues with the wi-fi calls. There are many times where my voice is delayed and a lot of times I end up purposefully making my calls on the cell network just to avoid the issue. I’m not sure that that would be improved with the Moto X. Maybe you have some thoughts? I can’t say I experienced any additional talking-on-a-cell-phone problems with the Defy XT than I did with my previous normal cell phone, except perhaps a couple people mentioned I sounded tinny. One time I noticed a delay but it’s not typical for me. Perhaps it’s the strength of the wireless network you’re on? I almost always make my calls at home. I suppose you could try the Moto X for the 30 day period and return it if the calls are not any better? But going over cell seems like a good solution. Ashley recently posted..Does Stocking Up REALLY Save? I used to think so… but not anymore. Nope. I’m assuming there will be a gap in the referral program since they didn’t announce the new one so I want people to sneak in before the deadline! I haven’t looked for the information, though. I wish I knew for the CJ ads if they are still doing account credits – I know there used to be ads themselves that said that but I couldn’t find any the last time I looked. I’m still going strong with a blackberry that I’ve had since they were cool (2009? 2008?) but I’m looking at changing carriers in the next little while. That is such a great question and I don’t know for sure. My inclination is to say that it should because aren’t all cell phones enabled to do that? Check out this thread for an answer provided in the RW community forums. I was waiting for the Moto X and they didn’t release it until after I upgraded to a different pre-paid. Since I did pay for that phone, I’m going to wait a year or so to switch again. To be honest though, I now qualify for a 15% service discount through my job at T-mobile and with that discount on a family plan with my husband, it wouldn’t cost much more for both of us than if we got the data plan on RW. That’s great that you found a plan that works for you that isn’t high cost. I guess the big advantage to RW would be if you wanted one of the lower tiers of service options. Unfortunately even with our discount Kyle’s Verizon phone is still way more expensive than mine. The Defy XT went downhill kind of fast in the last few months I had it, and it was 2-year-old technology when I first bought it. If you are happy with your phone, why change? I was started to get frustrated with the lack of storage space, for example. When I was researching options before switching to RW, I had come across reviews for the Moto X that were very promising, and I was not disappointed. I would say the camera on my iPhone was a bit better, but it’s not a huge loss. It’s kind of funny, I was trying to Swype on my iPad the other day…you get used to it! I’ve also had some issues when trying to send MMS messages. Actually the only photo on that post I linked to that wasn’t taken with the Moto X was taking by our iPhone 5… and I can’t really tell a difference! The day after I scheduled this post I actually received an MMS text, but I haven’t yet retried sending one. How I so wish Sprint worked in our area. Living in the wasteland of cell phone service has it’s advantages in some aspects, but cheap service isn’t one of them! Kim recently posted..How Much Money Would You Spend On A Sick Pet? What are the advantages? People walk around with their heads up? I hope this will be the tipping point for Republic Wireless. It’s an awesome business model that now has a modern phone. I’ve been really impressed with the Moto X’s that I’ve seen. It’s like they took all the best and most useful bells and whistles and stripped away the useless stuff. It’s crazy how a $300 phone can be so competitive with a $600 phone. I don’t know how phone prices are decided, but for us it was not at all prohibitive. We also get a $100 gift card for sending back our Defy XT. I hope RW will take off now, too! This phone was quite needed. Mrs. PoP recently posted..He Said She Said: Hustling Or Hassling? Thanks for this review. I am considering getting a new cell phone next year, and have been considering my options. It sounds like Republic Wireless has worked really well for you. The thing I would be careful about in your situation is whether there would be good Sprint coverage in all the cities you will be traveling to. I have a FreedomPop phone that uses Sprint, and the coverage is terrible, even in Silicon Valley. I also have a Tracfone that uses T-Mobile, and the coverage is much better for me than Sprint. My wife has a Samsung Galaxy S3 with StraitTalk. She is also on T-Mobile. I am happy with my Tracfone, and my wife is happy with her set up. That’s really good to know about the coverage issues, thanks for letting me know. We’re interested in FreedomPop also – how is it aside from the Sprint issue? My husband made the switch to Republic Wireless too. He’s very happy with it. He was an android user and he specificly loves motorola. So it was the perfect choice for him. I on the other hand love my iPhone so I decided to go with Page Plus. 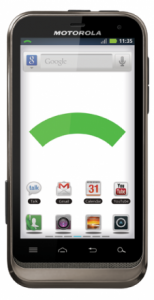 For those who want to keep their native Verizon 3g phones Page Plus is a great option as well. I love that their are so many options now and we no longer have to be stuck with the big carriers paying those huge bills! Hey, awesome! I haven’t heard of Page Plus before – I’ll look into it! I’m definitely not happy with my current provider. I spend an insane amount of money for a family plan. I’ve been thinking of switching to another provider but have to see if the service will be OK for my mom (who lives in the middle of nowhere, Maine). KK @ Student Debt Survivor recently posted..I love my job. Do you love yours? I guess if she can’t find anyone with Sprint service to ask about it, that’s the answer!